I don’t consider myself to be an egotistical person, but I’d be a liar if I didn’t admit that I adore getting comments in response to my ramblings. Good, bad or indifferent (and even the illiterate ravings of opposition fans), it's extremely gratifying to receive the occasional confirmation that my humble efforts have been read. It’s great to see the “page view” counter ticking over, but it’s far more satisfying to have tangible proof that I’m not just prattling away for my own benefit (and perhaps for my dear old Ma, who, bless her, is 76 today, so very many happy returns Mum – I only hope the Gunners can reward you with a fitting tribute). In response to the query, the photos shown of me and the missus in the header were taken back in the days when we had a few quid and were fortunate enough to be able to travel on several Exec trips all over Europe. 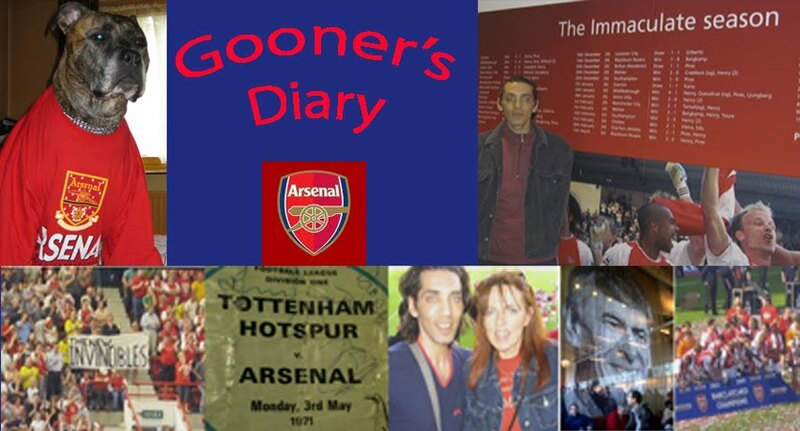 This was in the days of those Cup Winners Cup runs in the early 90s and it was great to be able to stay overnight, in destinations that one often wouldn’t think of visiting, if it wasn’t for us following the Gunners and to be able to get a little more flavour of these foreign climes, than when one flies in and out on the same day, on an organised outing, where, having been herded sheep-like, out of the airport, into a coach, into the ground and straight back onto the plane after the final whistle, one experiences so little local colour that one might as well have been to Leicester! However, above all, the principal motivation for paying through the nose to travel on these Exec trips was the buzz of being able to travel on the same plane as the team. I’m probably still paying for the privilege, with all the debt I accumulated on my plastic. But having completely tapped out all such lines of credit to the max, to the point where it’s such a struggle to pay for our two season tickets that I’ve had no choice, but to lease Róna’s ticket out this season and with the cost of these Exec trips becoming increasingly prohibitive, eventually there came a point where we could no longer justify the expense. So for example, instead of spending over 300 quid each to follow the Gunners abroad and spend one night in a hotel, we began to find better alternatives. Like the time we played PAOK Salonika a few years back, we found a last minute package holiday for a fortnight, for less than the cost of an overnight Exec trip and spent a couple of weeks on a lovely beach in Tolo, near Athens and hired a car to drive all the way up to the other end of Greece for the game. These Exec trips would usually go from Stansted, I guess because it’s convenient for the team coach to get to from North London and the plane would be divided into three sections, with the team at the front of the plane, us fans in the middle and the media at the back. Although they tried to keep the team separate, to ensure they weren’t hassled by us and the press and they were invariably whisked off on a separate coach from the airport, there was usually time, either when waiting at the gate for the plane, or waiting for their luggage to come off at the other end, when you could approach them for a brief chat and the odd souvenir photo. I’ve loads of great anecdotes from these trips, most of which I’ve repeated many times already, but without doubt the best experience during any of these European outings was on our return journey from Copenhagen, after beating Parma to win the Cup Winners Cup, as Tony Adams climbed on board the plane with the cup in hand and passed it back to the fans. We were lucky to be in the second row of fans and so we got our obligatory photo (see above), before one of the travel club bods eventually came and spoilt all the fun, by retrieving the silverware. I don’t know what they were worried about, as the cup was hardly about to go missing in mid-air! Arsène changed the arrangements for away trips in Europe and for a time, I believe those travelling on the Exec trips no longer flew on the same plane as the team. We also used to be able to rub shoulders with the players years ago, at Sopwell House Hotel, during the time when they were using the hotel facilities to change in, after the dressing rooms at the training ground burnt down. Yet as with the fences and electric gates at the new training facility, one gets the distinct sense that the powers that be at the club make more effort nowadays to ensure that the squad is segregated from the fans (and the media) and sadly, in my opinion, the opportunities to be able to actually meet them have become much fewer and further between. I remember making one of Róna’s sisters day when we were up at Sopwell House one time, as I collared Tony Adams in the car park, as he was walking to his car and he happily agreed to speak to Grainne on my mobile. She was naturally blown away, initially believing that whoever was on the phone was pulling her leg. During Thierry Henry’s time at the Arsenal, there were occasions when I got asked about getting him to sign something or other, perhaps as a present for an eager youngster and it would pain me to have to disappoint, by explaining that it was unlikely I was going to get an opportunity to obtain an autograph because unfortunately the chances of getting sufficiently close to players nowadays are so very rare. I’m sure most every Gooner will know who Maria is and if you don’t know who she is, you will recognise the sound of her voice, having inevitably heard her bellowing “Come on you Gunners’ either at a game, or when watching on the box. I remember years ago, I used to wonder if it was a little boy, with a particularly loud voice, but actually Maria is a diminutive, elderly lady, a retired schoolteacher, who, as an utterly devoted Gooner, has made the Arsenal her life for many years. It occurred to me when I was watching us play in Holland the other week and I heard the dulcet tones of Maria over the commentary on the telly, that it had been sometime since I’d registered the sound of her presence at a game. But by coincidence we bumped into her during half-time at Upton Park, where she told us that she’d travelled to Alkmaar on the Exec trip, on the same plane as the players and that on their return flight, apparently Cesc Fabregas got up and used the onboard PA, to say a few words to the more privileged of the travelling faithful. I’m sure I asked Maria what Cesc had to say and she probably told me that he thanked them for their support and expressed his hope that we’d be able to continue following them, all the way to Champions League final in the Bernabeu, but if I’m honest, I have to admit that as a result of another "senior moment", I can’t for the life of me remember. Nevertheless, I’ve an inkling that the actual details of Fab’s doubtless banal few words are not of any particular interest and for me, it’s not what he said, but the fact that he said them and I get a kick out of the thought that our club captain felt obliged to get up and fulfil his obligations as spokesman for the team. I only wish he could’ve done so for the benefit of everyone who travelled and not just the privileged few and the media rat pack at the back of the plane. Then again, the cynic in me can’t help but wonder if Cesc was encouraged to speak, by someone from the press office, purely for the benefit of the press! Meanwhile, if I am to make tomorrow’s midday kick-off, I had better get to bed and catch some much needed ZZZZs. However before signing off, in response to another comment, I want to make it clear that I didn’t intend to single out Senderos and Silvestre for special stick in my last load of waffle, especially after we’d just beaten the Scousers. I only wanted to express my serious concerns about Arsène continuing to play both these two players as our centre-back partnership in the next and hopefully any subsequent rounds. Personally I was never particularly happy about Wenger signing Silvestre, as to my mind the French defender is past his sell by date (at 32 odd?) and personally, whenever he played for Man Utd, I always saw him as their potential weak link. Besides which, I can’t possible imagine that Fergie was ever going to flog Arsène a player who he felt could turn the Arsenal into potentially more serious competition for his own team. That doesn’t mean to say I don’t respect Mikael, as word would have it that he’s seriously professional in the way he goes about his work and I would imagine that he’s a great example to some of the younger players. Yet I get the distinct impression that no-one is more aware of his own limitations than Silvestre himself and although he has undoubtedly developed coping tactics over the years, in order to deal with more talented opposition strikers and is unlikely to be caught dallying on the ball, trying to pass his way out of his own area, instead of smashing it safely into Row Z, for my money, I don’t like the message the club sends out when signing Man Utd’s cast offs. Silvestre is more than capable of doing a job for us and he has the versatility and the experience to make quite a useful addition on the bench, but I would much prefer to see Arsène bringing on the likes of Kyle Bartley, or another of our promising youngsters, because we know full well that Silvestre is not going to benefit from the experience, being on the downhill slope of his career. You could argue that it made sense to play him as a senior figure, to act as a role model for all the younger players and perhaps this is a valid point but I just don’t see the point in playing him and Senderos together. As for Philippe, I have always adored Senderos’ character and there was a time, a good while back, when I considered him to be perhaps the most likely candidate in the entire Arsenal squad, to possess proper captain material (or at least what I call proper captain material, which means the ability to lead in a vocal and demonstrative fashion, rather than having to suffer the sound of Arsène trotting out the standard “lead by example” excuse for the fact that his squad has been devoid of anyone capable of fulfilling the leader’s role in a more meaningful fashion). I didn’t see much of Senderos playing when he played in Italy for AC Milan, but there were more than a few Gooners who were gobsmacked to hear he’d gone there on loan. I have to admit that this unexpected move brought a smile to my face. Yet on reflection, I can envisage Philippe faring well on the Continent, especially in Serie A because the style of football might suit him better. When Italian teams concede possession, they tend to drop back into their own half of the pitch. As a result, the football in Italy tends to be far less frenetic, as they aren’t in the habit of playing a pressing game. As a result, with more time on the ball, I can quite easily picture Senderos being far more comfortable, without being in constant fear of being exposed for his undoubted lack of pace. And in truth, Philippe seems like such an amenable character that I would actually be quite glad to see him go and carve out a more impressive career on the Continent, rather than suffer seeing him castigated by insensitive Gooners, who will only remember him for the way in which he’s been positively decimated in the past by the likes of Drogba. I also wanted to reply to the comment from someone who appears to covet a few more of Rafa Benitez’s signings than I do. In addition to Torres, I did actually mention Mascherano, only because the Argentinian is the finished article, compared to Alex Song, who’s performances though admirable, are still riddled on occasion with evidence of his continued naïveté (principally, as far as I’m concerned, evident in the way he continues to allow opponents to get goalside of him). However who would want to sign Mascherano, a player who obviously appears to want to leave England and who I believe is going to be a source of great frustration for the Scousers this season, as how incredibly maddening must it be to see him completely run the midfield show against the likes of Man Utd, seeing him serve up a reminder of how influential he can be, compared to the majority of Liverpool’s other matches to date, where basically his lack of motivation means that he might as well have not bothered to turn up. I also agree that there was a time when I admired Alonso’s range of passing for the Merseysiders, but I honestly couldn’t have seen him playing in a midfield pairing with Fabregas and so I am not sure how Arsène would have managed to play the two of them together. Besides which, I know that nowadays we have to accept the fact that the loyalty of professional footballers comes bought and paid with vast amounts of pound notes (or Euros), but I continue to be suspicious of any player who appears to make career moves based solely on the moolah, without consideration for professional pride and the best choice of clubs as far as their football is concerned. I appreciate that their careers are short and that they have to cash in while they can and provide security for them and their families for the future. But to my mind, it doesn’t matter where top-flight footballers play nowadays; they are going to earn more than they could ever hope to spend in a lifetime, at any major football club. Thus I struggle to understand why a player would accept umpteen million to go and sit on a bench somewhere and get an occasional look-in, rather than take home one less sackful of spondulicks so as to be able to play the game they love every week. Call me a sentimental old fool, but I also have some notion that if the club have to get involved in a Dutch auction to encourage a player to come to the club instead of going elsewhere, then to my mind, if the money is his principal motivation, then he’s most unlikely to consistently sweat blood, week in, week out, for a team he’s only playing for because of the pound notes. Take Gareth Barry, for example. After playing for Villa for most of his career, in his shoes, I would’ve wanted to go to a club where I was most likely to win something. After all, he’s hardly going to be able to impress the grandchildren a few years down the line, by showing them his bank balance! Then again perhaps he’s deluding himself that he’ll be collecting medals at Man City in this lifetime? Talking of Villa, did anyone else see the highlights of their Carling Cup encounter at the Stadium of Light in midweek? By some coincidence, Martin O’Neill has found another “septic” (Guzan) to play between the sticks, as Brad Friedel’s stand-in, who, after having seriously impressed during 120 minutes of football, amazingly went on to save four out of five spot-kicks. Another name to catch my ear (again!) was that of Vladimir Weiss and while I didn’t see exactly what this youngster did to impress in Man City’s 5-1 spanking of Scunthorpe (as I only saw the goals shown on the box), the Slovakian lad definitely caught my eye in his performance for his country against Northern Ireland. With his dad being the manager of the Slovakian national team, surely nepotism would prevent him dropping his own progeny. Nevertheless I can’t envisage Weiss being particularly content to continue sitting on the City bench, missing out on regular match practice in the build to next summer’s tournament in South Africa. But if I don’t stop wittering on, I will never make it to kick-off (and just how long-winded I can be, is evident from the fact that the derby is today, when it was “tomorrow” when I sat down to start this missive!!). I’m sitting here wondering if we’ll discover any more new murals have been put up, outside the ground, in advance of our match with the old enemy. As if those poor, long-suffering Spurs fans needed any additional reminders of just how dilapidated and uninspiring their own gaff is and how little history they have to glory in by comparison. Hey Bernard -- thanks for the pre-game missive, I'm so used to reading you post-match that this was a rare pleasure! Come on Arsenal! I also appreciate you finally illuminating the mystery that is Maria!! Of course I always hear her on tv... but as a US-based Gooner, she was a bit of a mystery (I too originally thought it was a man with a higher voice). When I made it out to the ground for my occasional visit to N5 (this year's Emirates Cup) I was seated in the stands with my family in the same section as her, and got such a rise out of hearing her and all the old chants (devoid of the foul language as well, my daughter's thank her!). I have to say I enjoyed it a lot but did notice a lot of the locals chuckling and making eye-rolling glances her way. And yet to me, I was hoping everyone else in the stands would take her lead and start singing. That seemed to sum up for me, why our ground is so quiet all the time. Anyway... up the arse, let's kill the dirty Spuds. Enjoy the game, look forward to reading your post-match pontifications after we've thrashed them 4-1. I always wonder if my response is ever going to get seen, if I reply to a comment. I can but hope, as I don't want to start writing another blog entry, while watching Man U v Rovers (where you just know their deal with the devil guarantees a 90th minute winner if required and Fst Sam is far too much of a Fergie sycophant, to rock the knight of the realm's world!) and with Strictly Come Dancing on soon. I tend to be such a diffident bugger that I'm sure it was my missus who first started chatting to Maria when we used to travel on those Exec trips. She's the sort of amazing eccentric, who's ever present dulcet tones have become part and parcel of the Arsenal experience. I get equally annoyed when young wags take the mickey instead of joining in. In truth I've a feeling that she actually shames everyone into making sarcastic comments because she's so much more vocal in her support than they are! I also find it sweet that she's her very own cleaned up versions of all the familiar chants. It's funny, as despite being no spring chicken herself, years ago she always used to complain about not being able to go on the occasional awayday outing, because of not wanting to leave her elderly mother on her own! I'm always loathe to even raise the subject, but I can only assume that her Ma must've passed on by now, enabling her to be foot loose and fancy free, to follow the Gunners all over. But she's such a good ambassador for the club. I always remember first seeing her on foreign trips, where she'd be loaded up with all sorts of Arsenal trinkets (badges, scarves etc), to give to the local kids. I remember offering her a lift back to London from a friendly pre-season outing many moons back. But she politely rejected my offer, as she told me that she wanted to wait at the ground, to see the players as they boarded the coach, just so that she could introduce herself to a couple of new arrivals at the club! Also I recall going up to St James Park for the game immediately after winning the Cup Winners Cup. The club had only received an unofficial allocation of a few seats, as at that time St James Park was being redeveloped. But with it being our last match before the season ended, loads of us travelled without a ticket. Maria had the hump because some of her pals had managed to wangle tickets and she'd not been included. As a result I fond myself haggling outside the ground with a couple of local scallies for tickets for the 2 of us, as these youngsters would flog their seats and go and watch a live feed in the local cinemas. But being from the South they all assumed we were loaded and were therefore keen to fleece us. I managed to haggle with them, but we still paid well over the odds and so I wasn't supposed to tell anyone, as Maria didn't want her supposed pals to know how much she'd paid. But then I found myself standing with her on the Gallowgate at St James Park and it was brilliant, as the Toon were very gracious in allowing the Gunners to parade our trophy and their fans gave us a great reception. But I was absolutely bricking myself, as I knew Maria would be unable to resist her customary chant. If any of the locals took exception to having the opposition in their midst, they weren't going to vent their anger on a little old lady. Mercifully, when Maria could resist no longer, instead of "Come on you Gunners", to my great relief, she bellowed out a somewhat more vague "Come on you winners"! Meanwhile I'm pleased to report that although our fans today were getting a little frustrated towards the end of the first-half and starting to get on the back of the likes of Diaby, once the goals went in, we really raised the roof and the atmosphere was so enthusiastic, that it was as noisy as I've heard the place to date (other than those couple of minutes in the build up to kick-off of the Champs League semi) and it was very reassuring to discover that the new gaff does have a chance of developing into a proper cauldron on occasion. Thanks for the response Bernard, I enjoyed reading it. I could tell from TV that the ground seemed electric, it was a beautiful thing to see! And although my predicted 4-1 wasn't perfectly accurate, I did have the goal difference right! Tell Maria when next you see her that her chants (especially at the youth and preseason matches when its quieter) are heard all around the world!